By being an expert in the area of central airconditioning, it also helps us understand the cooling requirements of a diverse range of applications. This expertise, knowledge and the skills have helped us to have some of the most technologically advanced and energy efficient airconditioning solutions for small spaces. Ever wished your home was cooled just as well as your office? 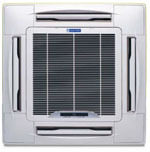 Opt for Window ACs and Split ACsfrom India's leading commercial airconditioning company. Built by incorporating advanced technology and unmatched expertise, they offer you exceptional cooling, significant savings and fresh, hygienic air at home.